Whether the need is for architectural details or designer objects: anyone in search of a premium precast product will sooner or later find himself in sunny Freiburg. There, located in a somewhat run-down industrial area, resides the “House of Stone.” The four-man company calls itself “Villa Rocca,” to which even cement giants such as Holcim and Dyckerhoff turn when they want their construction materials exquisitely processed for presentation purposes. One could be tempted to call them the B Team. Analogously to the famous TV series, Christian Egenter has called in three additional specialists. Each is responsible for one special area of specialization – and together they provide the experience needed to conjure up a top-class product from an often underrated material. All three share a common love for the material “C,” i.e. “C” as in concrete. If we follow the production chain, then first of all the joiner and carpenter, Petar Ivanisevic, is responsible for producing the wooden form, while reinforcement engineering is the responsibility of Hermann Schäffen, the fitter. Alexander Knobel, the second joint partner in the company, is responsible for creating the correct concrete formulas and mixing. And finally, Christan Egenter is in charge of processing and post-production surface enhancement. Even if administrative tasks take up noticeably more of the company founder’s time, hands-on technical work still makes up the core of his activities. Although his first concrete objet, a blue loudspeaker box, was manufactured as far back as 1990, the master bricklayer and concrete master builder became self-employed only in 1997, when he started a concrete furniture production. At that time this sounded so absurd to the Chamber of Trade, where he had applied for registration, that it quickly absolved itself of all responsibility and sent the company founder to the Chamber of Commerce. Work surfaces for fitted kitchens and an adjustable shelf system were the first products he successfully offered for sale. It was only a small step from watertight work surfaces with integrated sinks to washbasins and other bathroom accessories. Even today, the production of these kitchen and sanitation components represents an important economic backbone for the business. While the company was still manufacturing products from conventional concrete before 2000, the advantages of Flowstone for in-house production were rapidly discovered by the business. The breakthrough for the small precast factory came with the production of the honeycombed membrane wall for the Cocoon Club in Frankfurt am Main. The disco of the famous DJ, Sven Väth, was created by the Wiesbaden design office of 3deluxe. An essential component of this organic-amorphous interior structure is a central, triangular dance floor, which is separated from the surrounding development by the honeycombed membrane wall mentioned above. Executed as an open construction on both sides, this 2.50 m thick hedge-like and ceiling-height room divider accommodates all the required technical lines and routings. Furthermore, located within it are small booths illuminated in green light, the space offered by which reminds one a little of the comfort provided by an American stretch limousine. They are called “cocoons” and give the club its name. The wall consists of a single 80 x 80 cm wall element multiplied 800 times. It is formed in such a way that each of them can be moved by 180° and be reset in relation to one another. In doing so the pattern of the kidney-shaped perforations has such a bewildering effect that the eye does not recognize the repeated pattern. In turn, the wall element itself consists of two components. They both have the same basic pattern and likewise can be turned by 180° and screwed together in a sandwich-like manner. In contrast to the front element, the rear component is additionally equipped with a spacer. The elements are secured to a steel sub-frame by means of horizontal profile rails. The corners of the circular precast concrete hedge are rounded off in a kidney shape. Here it was necessary to arch the individual elements at a radius which was both correct and matched each other in each case. At the same time, the correct stretch and compression of the elements had to be taken into account in order not to deviate from the grid pattern. Of advantage was the fact that all of the molds were produced from polyurethane, which was simply incorporated into wooden frames. Thus, one only had to construct new arched frames, into which the old polyurethane molds could be re-inserted. They were adjusted to the radius and could also be stretched to the longer length without any problems. The molds were made smaller in order to compress the elements, while additional polyurethane was applied to the edges. Worthy of note is the craftsmen’s accuracy. Although the total wall development amounts to over 100 m, a joint tolerance of just 1 mm was achieved in spite of the curves. Christian Egenter and his men required a good six weeks for the manufacture of the elements. During this period, two production cycles on three tables were operated at his premises. In each case, the first cycle took place early in the morning and the second just before closing time. Daily output amounted to 24 elements. Villa Rocca required eight weeks for assembly, which began at around the first half of the production period and then ran parallel with it for some time. For conventional orders, such as kitchen countertops or sanitation products, the Freiburg manufactory uses wooden forms made from plastic-coated multiplex. However, the form sheets can be used a maximum of two to three times, as otherwise the absorbent contact surfaces leave their impression on the casting in the form of color changes. The side forms, manufactured from the same material, are connected by joinery to the base plate. Finally, all corners and edges are cleanly sprayed off with acrylic. This not only prevents the concrete mix from penetrating into the form elements. It also ensures that the edges are imperceptibly rounded off. If an organic workpiece is to be produced, a prototype is first of all made, from which a polyurethane cast is taken. This is incorporated into stable wooden form. After hardening, it is then used as stiffening for the subsequent casting operation. After the concrete workpiece has hardened, it is taken out of the wooden box together with its rubber-like mold. On account of its flexibility and elasticity, the polyurethane mold can simply be removed and re-used. Reinforcement engineering Work slabs up to a length of 4 m are nothing unusual for Villa Rocca. As production in the meantime has had to give way to the fact that huge work slabs can no longer be produced of solid concrete, for reasons of weight, they are currently manufactured with an integrated apron at the side. In this way it has been possible to reduce the material thickness to 6 cm. The special-purpose reinforcement used for casting in horizontal position, is suspended from above by thin wires. The wires are pulled out after two hours, when the first surfacing operation begins. The apron cast with the slab in one operational process in order to achieve a watertight material bond. A partition made from expanded metal is inserted along the bordering areas in order to prevent the material from flowing away at the sides. This holds back the aggregate like a sieve, while small amounts of the cement paste diffuse through and can bond with the adhesive agent of the horizontal slab. 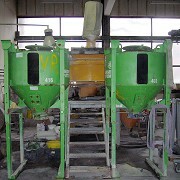 Mixing equipment In order to realize the Cocoon Club job, the 150 l capacity manually operated mixer, which had been sufficient up until that time, was replaced by a 1-t mixing plant. 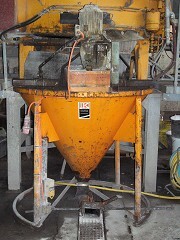 When the mixer was purchased, great value was placed on having the option to dismantle the equipment at short notice for larger orders, in order to produce concrete on-site, if necessary. With a great deal of ingenuity, a way was found to minimize the weighing process of the constituents of the concrete. A set of digital livestock scales was converted and is now used as a fork-lift pallet, on which a tub is located and with the aid of which the aggregate and cement are transported to the mixer. The porridge-like raw material is transported from the mixer to its mold in a tub, into which a self-built cone-like agitator is integrated. Although this reduces the capacity of the container from 1 t to 750 kg, it does ensure that the self-compacting mix, which solidifies quickly, remains flowable for longer. One further advantage: in dire emergencies, more water can be added to the tub if the consistency is not right. Aggregates and color In the opinion of Alexander Knobel, Villa Rocca’s concrete specialist, Flowstone is relatively difficult to set up. Too little water leads to the formation of pores and air holes, while too much results in unsightly leaching and the formation of streaks. For that reason, when checking for the correct consistency, the specialist relies on the haptic feel of his hands. Color finds its way into the concrete both in the form of pigments, with which the cement paste is dyed by means of color sand, and also through the targeted use of gravel mixes. The Freiburg concrete specialists like to use Rhine gravel and material from a neighboring gravel pit as their ‘character’ stone. Its disadvantage is that the lighter components of the relatively non-homogenous mix tend to float on top of the dense Flowstone. During grinding, this leads to an increase in stone cuttings which become noticeable afterwards in the form of large, discolored stains. It is therefore only used if this effect is intentional. For white workpieces, such as the wall elements of the Cocoon Club, and also for colored pieces which are to possess homogenous coloring, the Freiburg company is happy to resort to high-purity (99.9%) Cramberg quartz, which can be used both in the form of sand and as aggregate. The preferred grading curves for gravel are 2 to 8 mm and 8 to 12 mm. A grain size of 0.2 mm is primarily used for sand. After approximately two hours, the upper face of the precast component is smoothed. The component usually remains in the form overnight and is taken out of the form after 12 to 15 hours. The actual surface finishing is begun after five days. Components that undergo severe exposure to the weather or water are first of all waterproofed and are only then finished. As a rule, six wet-sanding stages are carried out. A 60 grade grain size is used for the initial sanding, while the final sanding is carried out using 1800 grade. The process basically begins with the rounded profiles and edges and then works round to the faces. As the element is usually allowed to dry off overnight, the surface is crystallized the next day in a final processing step. Incidentally, in order to maintain kitchen worktops Christian Egenter recommends to simply rub olive oil into the surface regularly. The direct and indirect presence of Villa Rocca at trade fairs is increasing. Most recently, their works was showcased at the Ulm Concrete Congress and at BAU in Munich, as part of the Dyckerhoff stand. At interior design trade fairs like the Blickfang in Zurich or the Passagen in Cologne, Villa Rocca is present with its own stand. On these occasions, Christian Egenter regularly emphasizes that advertising in one’s own field is always bound up with the basic work of promoting concrete as a raw material. This is hardly surprising since, at such equipment trade fairs, cast stone is always in direct competition with other materials already established in interior design. In a certain sense, Villa Rocca is engaged in pioneering work on behalf of the whole concrete industry; this is how the son of a well-known Freiburg precast company entrepreneur sums up the situation. Egenter’s credo: Anyone who has a concrete kitchen fitted at home, will from that day on drive over a concrete bridge with quite different feelings.